Admitting it is the first step. Admitting that you are a foodie, that is. Here is the problem I have with saying those three words (I'm a foodie), it's a little bit like admitting to being a yuppie. See, I have this fear that by admitting to being a foodie, I can no longer enjoy midwest casseroles, velveeta mac n cheese and Lipton onion soup mix. Don't get me wrong, I adore imported olive oils, truffles (the kind dogs sniff out of the dirt) and fig jams. But every once in while, don't you just get a craving for something down home, something warm, something classic? That doesn't mean you can't put your own creative twist on it, in fact, that was the base of my restaurant; classic food with an eclectic twist. So, sure I'm a foodie, but a classic eater type foodie and I'm not afraid to admit it! Take 4 russet potatoes, wash and medium dice them. Place them into a deep oven pan. Now dice a yellow onion and 3 garlic cloves. 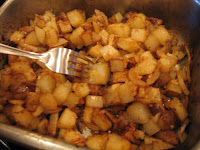 Toss them with the potatoes, adding in olive oil (about 1/2 cup), 1 envelope of Lipton's Onion Soup mix, and pepper. Place in the oven until the potatoes are fork tender. Stir every half hour. Serve as a side dish to brunch or add to my egg and potato burritos. Enjoy and don't forget to be fat and happy!